I got the lower cabinets painted, but I didn’t get them polyurethaned. Why? Well, because I went to Lowe’s yesterday to get more matte finish polyurethane, and they were out. I’ve never been more convinced of my celebrity status than I am now. I’ll explain, and I’m sure you’ll agree, but first, here are my painted lower cabinets. I can’t wait to get this finished!!! Those columns turned out just as I had envisioned. When everything was bare wood, I was getting a bit concerned because those columns just seemed to really stand out and demand attention. But now with everything the same color, they look just as I had imagined. They’re a pretty architectural detail, but they’re more of a subtle detail now rather than a front-and-center, demand-your-attention feature. So now as far as my celebrity status, let’s look at this logically, shall we? 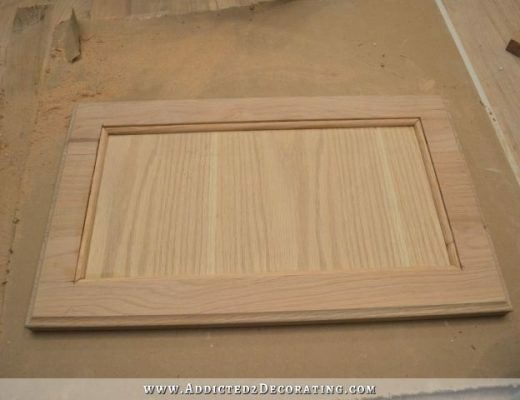 At the beginning of this week, I have trouble with the finish on my cabinets. It’s way too shiny. Then I go to Lowe’s to pick up some Rust-Oleum polyurethane in a matte finish to try over the shiny paint. When I bought mine, they had at least five more in stock. I’m sure of it. I come home, use that matte polyurethane finish on my cabinets, and they turn out gorgeous. It’s the perfect velvety satin finish. I share that info here on my blog. Then I go back yesterday for another quart, and they’re completely out of matte finish polyurethane! Not even one in stock. Oh, there’s plenty of satin, semi-gloss, and gloss. They have all of those in quarts and gallons. But they’re completely sold out of the matte finish. Right? I mean, come on. If that’s not irrefutable proof of my celebrity status, and that, “When Kristi talks, people listen,” I don’t know what is. You’re welcome, Rust-Oleum. And Lowe’s. Okay, back to reality. 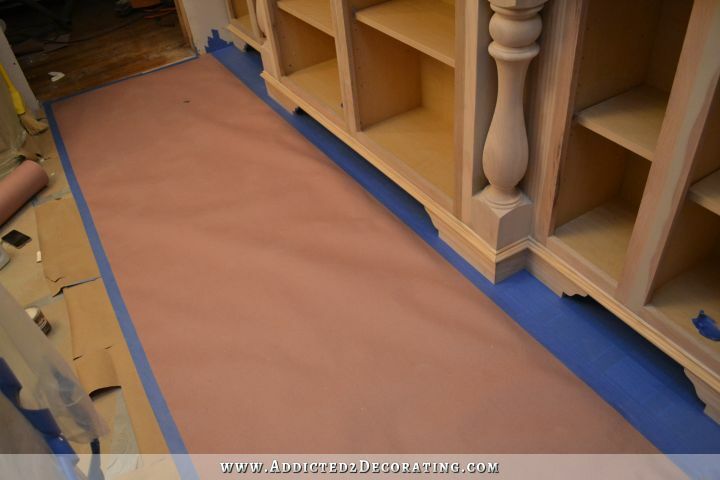 I had many people ask me how I was going to protect the floor around those feet on the cabinets in order to spray the cabinets, so here’s how I did that. First, I folded back the existing paper that’s been down for a while to protect the floor. Then I used the widest painters tape that I could find at Home Depot (about 1.5 inches wide), and I used that in the space between the decorative feet and the toekick. 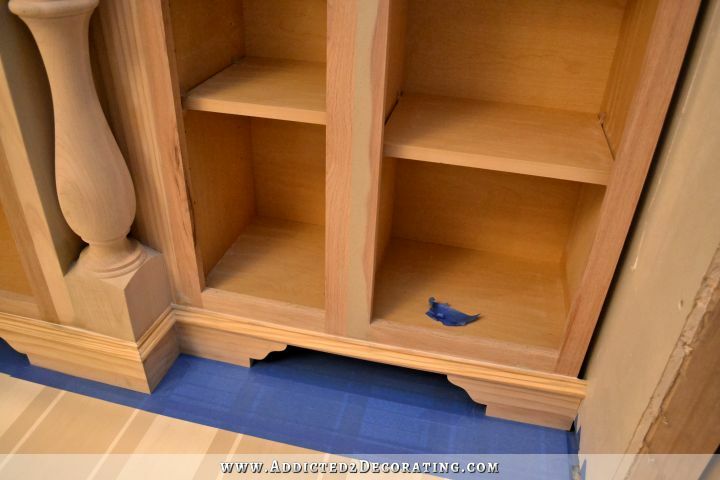 I also added about four additional rows of tape in front of the side sections of cabinets so that the tape was even with the tape on the center section. Simple as that! So was I able to prime and paint every single bit of the toekick behind the feet? Probably not. But every single bit of it that can be seen from any angle (plus some, since I used my sprayer) is completely painted. I’m not worried at all about any parts that can’t be seen not being painted. I didn’t get the other four doors gold leafed because…well…life happened yesterday. You know what I mean? I’m talking about those frustrating real-life things that get in the way of your grand plans for the day, and before you know it, it’s 5:00pm, and you’re just now getting started on the thing you had hoped to spend the whole day doing. So I started at 5:00 yesterday, beginning with the sanding of the wood filler that I had added the day before, and then I caulked everything. Then after dinner, I primed the whole thing and had to wait for it to dry before I could sand and paint. I didn’t get started painting until about 9:00pm. Painting took me about two hours. Two hours!! And let me tell you why. (Please…if you bought a Critter sprayer at my recommendation, please pay attention!). It’s because I ran out of paint strainers, so I ended up having to just pour the paint directly from the can into the jar without being strained. That might be okay when you’re using a brand new, only-been-opened-to-be-tinted can of paint. But when you’re using a can of paint that’s been opened and closed, shaken, stirred, and had leftover paint poured back into it many times over the course of a week, it’s a big mistake. I spent about 45 minutes of those two hours actually painting. The other hour and 15 minutes were spent trying repeatedly to get the sprayer unclogged. It would work just fine for about 10 minutes, and then get clogged. Then it would work for two minutes, and get clogged. And so went the entire two hours. So just save yourself the immense frustration and always keep some paint strainers on hand. I use the paper cone paint strainers (just google to see what they look like), and I get them from my local Benjamin Moore store for about 15 cents each. I’ll never let myself run out of them again. Ever. Beautiful! Loving these cabinets! Never thought I’d like green but you’re slowly selling me on it! Can’t wait to see the wall completely finished!! Beautiful! Even prettier than Cameron Diaz’s! And when finished with that beautiful floor…Awesome! The columns look great now that they are painting, and the way they line up with the sconces is awesome! Perfection in my symmetry-loving mind. 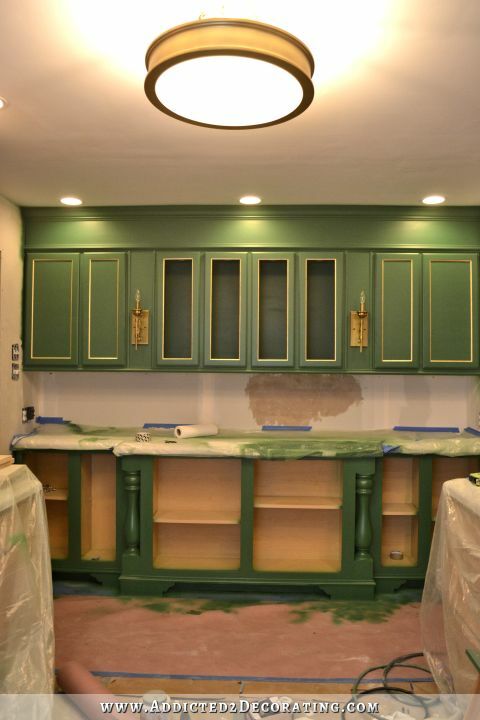 The green cabinets look amazing. I love that you are doing something different than the sterile all-white kitchens with light gray walls that you see on most other blogs (not that they aren’t beautiful, but some of us need color!). 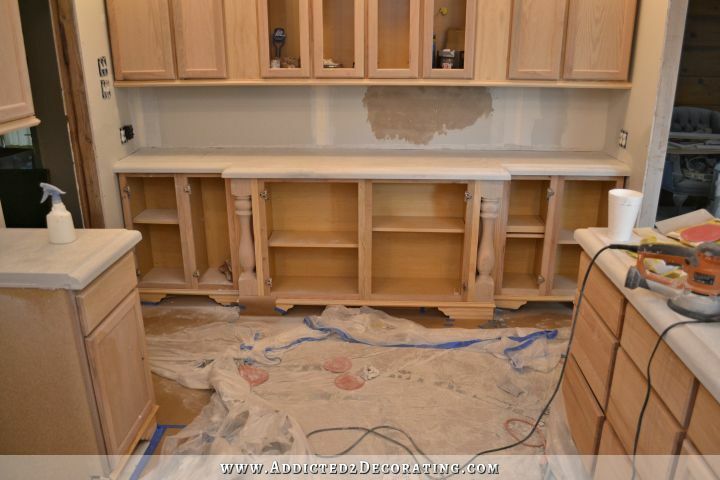 We have almond-colored cabinets painted by the previous owners, and they are chipping. This makes me want to paint them in a fun color! I am loving this color! I wasn’t sure at first but it makes me want to try something bold in my kitchen! It’s like a page-turning mystery…just keeps getting better and better and you can’t wait for what’s next! It looks so gorgeous! 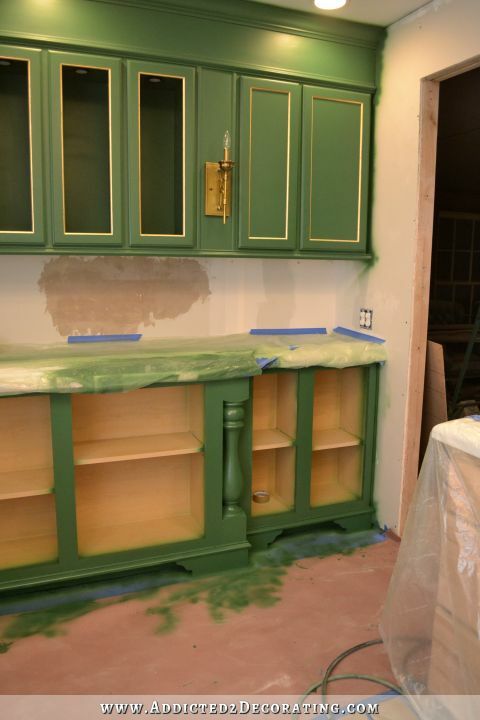 I wasn’t too sure about the color green for cabinets but I’m loving the look of it!! Look on the bright side. Your many mishaps and “real life” interruptions are giving you great material for your blog. What would you write about if everything went smoothly? Looking beautiful Kristi. Question: What kind of compressor do you use with your Critter? I have a Porter Cable compressor I use for my nail gun but I am afraid it will not have enough pressure for the paint gun. If that taping only took you 10 minutes, you are a much better taper than me! No matter how busy i am, when you hit my inbox I take a minute. Often i pour another cup of coffee. I truly enjoy your blog! .. but does he ever object or ask you not to do something a certain way or color? Cuz I’d have said no way to that green color and now I really like where it’s going! Just curious! Kristi, you’re a rock star to me! That missing poly is all you! I’m thinking about investing in a Cricket sprayer. Do you thin your paint, as well as strain it, before spraying? I’ve read other people insisting that this is necessary. If so, what kind of ratio do you use? Spray painting is all new to me. Thanks! And, of course, your kitchen is looking amazing. 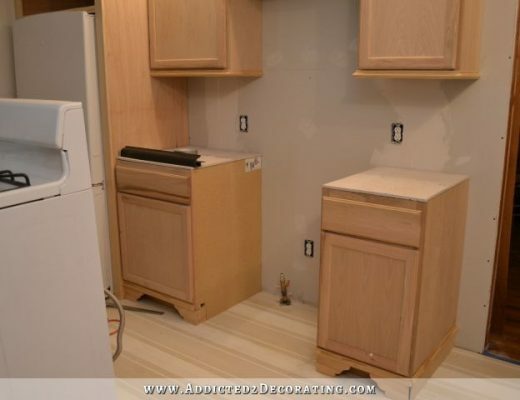 I’m really excited to see the backsplash against those green cabinets. With the hint of gold leaf……Oh, my word….glorious. GREEN cabinets? Uh……….IT’S GORGEOUS! This is not the Hunter Green I was afraid it was going to be. This color is perfectly perfect. Still eating that crow. Can’t wait to see how Monday’s post is going to look. AFter I read each one of your posts I need a nap! You do so much in a day that it makes me tired just to read about it. : ) They look great and i definately like those legs painted so much better. Happy Productive Weekend! What chandelier is it? Do you have a link? I looked, but I’m not sure which one you’re thinking would work. Thanks for the info about VanDykes! I still need to take a look and see if I can find something I like. And then onto the backsplash on that wall or the next bank of cabinets? Are you still planning on herring bone subway tiles or has the finished look of cabinets and counter together given you other ideas? Love the cabinet wall! And your blog!–I get concerned for your welfare when you miss a day posting! Wish I had free reign to do what I wanted in my house–my husband tends to veto everything I want to do, so I have to do things when he’s not around and then he doesn’t even notice! But it also makes projects take 10X longer which means I have about a dozen projects that are in some state of incompleteness. Regarding the matte poly–I found it at Lowes through an on-line search about a year ago to use over faux finishes on walls–it works fabulously, but of course when I went to buy it at the store it was out of stock. They seem to only get a few cans in at a time and it takes forever to get restocked! I would go somewhere else, but I’ve never been able to find another brand that is in stock anywhere else at all! Hope you find it this weekend so you can finish your wall! Those columns are so elegant! Now that I’m seeing these done top & bottom, I’m not sure about the corbels! I am thinking they might take away from the cabs! Truly, “elegant” is the word for this project! I would totally consider you a celebrity! If I ran into you in Home Depot I would scream like a Bieber Fan! LOL. Ok so I really love the color and the gold. I also love the softness the matte finish gives the cabinets. 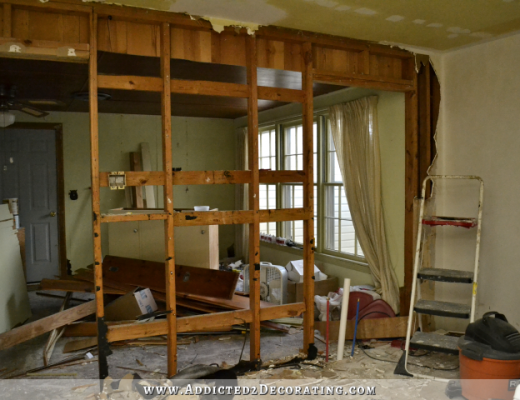 I predict we will see a finished wall of cabinets on Monday! Don’t under-estimate how famous you are. I love the cabinets even more with each posting. We’ll all have a virtual tea party when the end of the kitchen is completely finished. LOL. I read this comment yesterday, and I’ve really been considering it. I loved the idea of a black ceiling, but I finally realized why I wasn’t ready to just jump right in and do it in my kitchen. I think one of the things that makes that black ceiling in the bathroom so amazing is that it’s completely “framed” with white crown moulding around the entire perimeter. In my kitchen, that wouldn’t be the case. On some parts, it would be right up against green crown moulding, and in other areas, it would be against white tile. I think it might lose some of its impact that way. Well, Kristi, I always *knew* you were a celebrity! How frustrating that you couldn’t get your matte sealer, though. 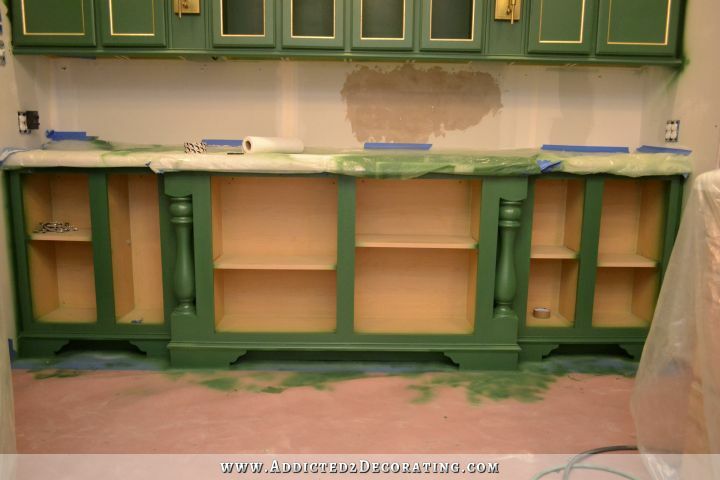 The cabinets are *drool worthy*! I agree with what someone upthread said, the whole set up looks even better than the Diaz kitchen so far, and your’s isn’t even finished yet! I remain impressed with your vision, stick-to-it-iveness, and energy level! *yours. * I swear I graduated university and have an excellent grasp of the English language even if my paragraph above belies that! I haven’t seen anything like that on my site recently, and I’m not seeing anything like that on here now. I use several different ad networks, so it’s virtually impossible for me to report/block ads like that unless I know exactly where they appeared (i.e., which ad slot on my site) and exactly what the ad was promoting (i.e., website URL, product name, or business name). If you can help me out with that, I can see about blocking the ad. It was an ad for USA Today for a tv show called satisfaction, from what I can remember. as I came to reply to your comment today, the ad was thankfully for a cannon printer. Whew! When your kitchen is done, ( which should be soon at the rate you’re going) could you do a post about spray painting? I need tips on how to use a sprayer. How you clean it when you’re done painting. And do you have to clean between coats of paint? What if the coats are the next day? Can the paint filled sprayer sit overnight? A video could be very helpful. How do you prepare the sprayer? Do you add some type of product to your paint to get it to spray evenly? So many questions! Makes wish I lived next door to you. You could teach me so much. Me too. I want to know how you got such a perfect finish. I cannot get paint sprayers to do that. Mine always runs. AND how did you get a good finish behind the decrative posts? I really think it’s just the spray gun I have. It sprays such a fine mist of paint that it’s almost impossible to get it so thick that the paint runs. I have yet to get a single run, and I was spraying those columns really close. OMGEEEEE! I am so totally jealous of the ability to have such colorful ‘bones’ in the kitchen. The hubby was pretty insistent that we keep ours a ‘normal’ color – and we went with off white – and used red and black as accent colors. don’t get me wrong its pretty – probably the nicest kitchen I’ve ever had – but you – WOW – awesome gutsy green!!! I LOVE it — and now that you have done the bottom it is even better, than I could have EVER imagined! Best of luck for the rest of this amazing project! 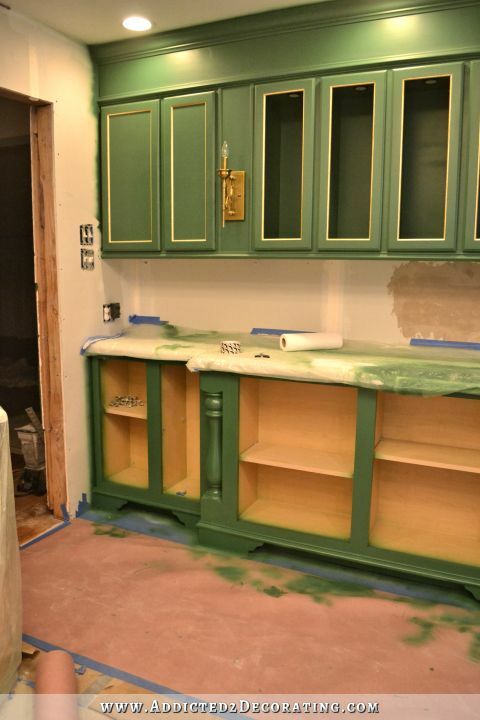 Green has always been my favorite color, so I was thrilled when you decided to paint your cabinets green. But they are more beautiful than I could ever imagine! As far as I am concerned, you are more of a celebrity than most movie stars. Your kitchen is going to look so cool!! I’ve told so many of my friends about your blog recently!! I’m curious how you sprayed behind those columns? It just took some very strategic aiming with the paint sprayer. 🙂 Fortunately my paint sprayer sprays such a fine mist of paint that I can get really close and the paint still wont run or drip. So I was able to really get in there and spray all the nooks and crannies. Great job Celebrity Kristi! That sounds like a busy weekend you have planned. I hope you take at least one day off a week. Helllo….HGTV….This amazing women needs her own show…. love love love everything you do! I was thinking about those columns – hoping they wouldn’t be difficult to paint – and they look PERFECT! I’m in awe at your courage: If I’d covered this (beautiful beautiful!!) floor with paper, then sprayed dark green paint on the cabinets, I’m sure I’d tear the paper with my ladder or feet and paint would soak through! How do you manage to keep attention to things like that in among all that work? I love the way the wall turns out and I’m looking forward to seeing it in all its glory with the white details of your backsplash, countertop and floor. I was afraid in the beginning that the green might be too dark, but I’m pretty sure now that it’ll turn out absolutely perfect with all that white around. Hope you can take a break in between and relish the weekend! I just try to be careful. 🙂 I do have a few spots where I dripped a bit too much paint, and I’m just hoping that it wasn’t so much that it soaked through. Your cabinets look fab! I’ll bet that matte poly did sell out because of your celebrity! I know I immediately went to the web site for my local Lowes to see if I can purchase some (sadly, they don’t carry matte on the shelf at ours, so I’ll have to order it). I’ll bet your local readers bought up the rest! Hope they have it back in stock for you soon. Love watching your progress! Thank you, Thank you, Thank you!!! 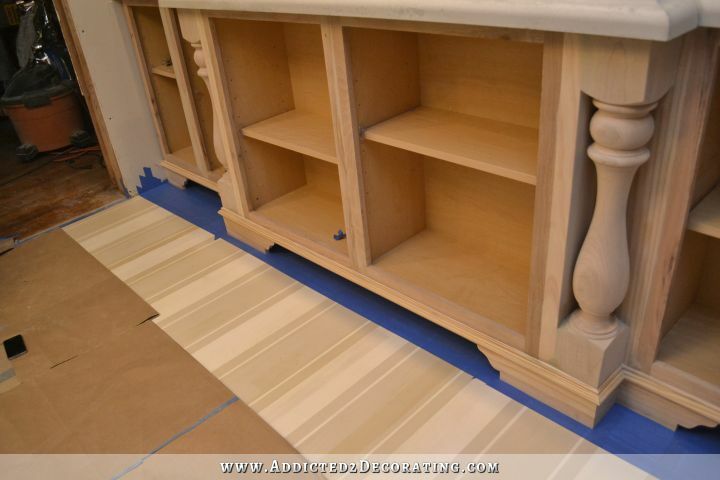 I am painting my kitchen cabinets right now as well! I finally gave up with the sprayer/ painting yesterday, the darn thing kept getting clogged! I will look for the strainers Monday, super frustrating! Do you have any suggestions for PSI? The trigger also keeps getting stuck. Thank you again, hoping for less frustration soon! Love the progress! I’ve found that 90 PSI works best for me. Not sure about how to fix a sticky trigger, though. That sounds frustrating. Does it maybe have paint in/under it that’s making it stick? Thanks for getting back to me. I am using mine at 90 PSI as well, lower just doesn’t get the job done. I was able to fix the trigger problem. Unscrew the bolt/ end cap on the top of the handle, take out the spring, then I used a large paperclip to push the pin out going behind the trigger through the back of the gun. Once the pin is out, clean it out, push the pin back in, put the spring back, and then replace the bolt/ end cap. Works great again! YES! This is even prettier than Cameron Diaz’s kitchen! It’s gorgeous! I love it. You have a sophisticated sense of color and and amazing eye for composition. The way that it is all coming together is just incredible. It’s called Critter, and I bought it on Amazon. It hooks to a compressor.